Info "Turn the dial until you hear the click to ignite the flame. It’s a little finicky, so give it a few tries." Now You're Cooking! is one of Penny's Microgames in WarioWare: Smooth Moves. 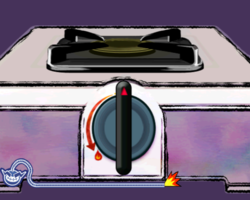 The player must twist the knob counterclockwise to start the fire. 1st level difficulty: One turn. 2nd level difficulty: Two turns. 3rd level difficulty: Three turns. This page was last edited on February 20, 2018, at 16:30.